How many jobs can a tiger create? At a time when job creation is a major issue for governments in all parts of the world, let me propose to think more about new avenues such as the valorization of natural assets as job creators. A good illustration of that could be the tiger in India. This animal, as the reader will soon discover, is a great proxy for anything that can create tourism related jobs. Tourism jobs are economically extremely important because they can benefit from the current explosion of the middle class worldwide and its demand for leisure, travels, tourism; they are largely low skills jobs, therefore allowing many individuals to enter the workforce, and finally they are “development” jobs since the skill improvement is continuous and measurable, from the cleaners to the hotel managers, allowing individuals to build real careers. I realized the value of tigers as job creators while I was staying last winter at the Corbett Tiger Reserve, 300 km north of Delhi, on Himalaya’s foothill, in India. I was there for a week, waking up every morning early, being then driven in a Jeep, among mostly middle class Indian tourists, hoping to catch a glimpse of the wonderful animal, missing him most of the time, and wanting to try again the next day. Even if the park and the surrounding villages are still only basically equipped with tourism infrastructures, I was amazed to see how many people lived out of tourism there, from the large hospitality staff at the eco-lodge I was staying at, to the jeep drivers leading large number of Indian middle class tourists through the park, to the hundreds of guest houses flourishing there. It seemed to me that India is sitting on a relatively unexploited goldmine with its tiger reserves and that many are quite unaware of it. Tigers, and therefore tiger reserves, are a powerful example of strategic and societal choices in job creation, of interactions between political, administrative, ecological issues. The tiger, dead or alive, can be considered as a job creator. What is the value of a dead tiger? The benefits of a dead tiger are numerous. For the hunters-poachers first, obviously, because the skin and various parts of the tiger’s body represent an important market value for medicine and traditional activities particularly within the Chinese population. For the peasants around the tiger habitat because the killing of tigers relieves tensions around the cohabitation between the tiger and the cattle. For the officials in charge of guarding the reserves because closing their eyes on the poachers’ activities can be quite lucrative in terms of bribes, sometimes more than a year salary for one tiger killed. For the officials in charge of the reserves or the forest it occupies because, when all tigers will have disappeared in a given reserve, it will become possible to declassify a reserve and exploit its wood, a substantial potential value currently out of reach, or use more land for agricultural or urban development and industrialization. Finally and ironically, once tigers are dead the administration of the reserve does not need people to guard and maintain it, opening the gate for substantial savings for the administration. For all of these stakeholders the benefits are tangible (i.e. real and immediate money), relatively easy to reap, and ultimately presenting a win-win solution both short term and long term (although the long term value, the one that can be translated into a NPV (Net Present Value) applies only to the land reallocation and exploitation). The facts that a world without tigers is losing an important natural asset, that this attitude leads to the extinction of a rare specie, even that the local eco system might be disturbed forever, do not bother them because their concern is more with making money now, a perfectly understandable concept in a world where agricultural poverty is often the rule. Strict rules, systems of punishment for the corrupted individuals or the poachers might change this behavior a bit but nobody has illusion about their effectiveness. Another way of looking at the issue however is to consider the value of a live tiger. What is the value of a live tiger? The tiger alive is a very different economic animal than the dead tiger and one will see that its economic value, and its potential to create jobs is drastically superior to its “dead” value, even without taking into consideration the ecological dimension of the protection of an endangered specie. A living tiger creates many kinds of jobs. First, the attraction of tourists into the area for trying to see the tigers creates an incredible number of local hospitality jobs opportunities, from hotels (of all levels, from zero stars guest houses to 5 stars hotels), to restaurant, jeep drivers, guides, park supervisors, etc. for whom the revenues of tourism will provide a constant and substantial amount of economic value with a very high NPV. All of these jobs are created locally, benefiting the local area economies in several ways: giving jobs to locals, attracting more individuals to live and work locally, generally with higher skills and therefore higher income, whose spent will benefit all the services these new comers will soon be consuming (housing and construction, food, all services, transport, rejuvenation of the school systems, etc.). Second, the tourists themselves, not only generate jobs via the local hospitality services they consume for seeing the tigers, from hotels to catering to drivers, etc., but they soon generate more demand for several seemingly marginal activities like local handicraft. By buying local handicraft, they are raising the quality of the goods, the education of the workers, the revenue redistributed in this way. Tourists also foster an entertainment industry, taking care of them during the day and at night. They finally foster the development of better tourism infrastructures to bring people in and out of the reserve area. Third, for countries like India or a continent like Africa, such an activity has a much broader influence than just the local or regional job market dynamism outlined above. By encouraging tiger reserves and tourism infrastructures around the tiger parks, the countries can promote its overall image as a tourism destination, as an eco-tourism place, fostering this way more activities for whole industries, from tourism agency to transportation to other tourism places that can benefit from the attraction power of the tiger reserve. Other ecological parks or resorts can then open and become part of packaged tours. The value of live tigers is therefore so important that, if the right policies are put in place, the stakeholders interested in dead tigers could find more benefits in protecting them than in killing them. Why it is the right moment to invest in tigers? Tigers represent today an incredible opportunity for several reasons. The first of them is that they still exist… it will be harder to attract tourists to see the former habitat of tigers than to attract them today with the real thing. But the situation is bad, there remains, according to the WWF, only 3000 tigers in the world, against 20 000 in the 80’s and 100 000 at the beginning of the 20th century. Second, tigers can help ride the wave of mass middle class tourism currently exploding in emerging markets. This wave is going to last for at least three decades and will bring enormous resources into the economy. Tourists from the OECD countries are certainly a potential too, especially with the ageing of OECD countries that still translates into a large population being rich and old and ready to travel the world. This population is however relatively small compared to the potential represented by the massive arrival of populations of emerging markets into the middle class consumption pattern (see figures below). As a side, this means that investments in middle class accommodation is probably a much bigger opportunity than in five stars hotels. Figure 1: International tourism arrival by region (these statistics do not include the rise in local national tourism that is a much more important factor than international tourism for countries like India or China). Source: UN World Tourism Organization, Tourism 2020 vision. 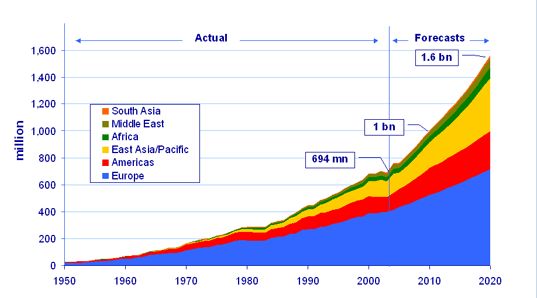 East Asia and Pacific are growing at 6,5 % annually between 1995 and 2020, Africa at 5,5% and Europe at 3,1 %. Figure 2: Rise in domestic tourism in India (in millions). Currently already more than half of the Indian population engages in some form of domestic tourism (domestic tourism statistics consider only individuals moving between states, if one includes the intra state tourism the figures are much bigger). Further more, as a point of reference, foreign tourists in India represented only 13 millions visitors in 2009 i.e. a very small part of the total tourism business in India. Third, they benefit from a current “fashion” for ecological tourism, wildlife experiences, etc. that makes a tiger reserve more attractive for many than a one time crowded visit to the Taj Mahal. They can de facto sponsor a new form of tourism infrastructure by which eco-lodges will be able to flourish and to generate more innovation and economic dynamism. These innovations will be found in new infrastructures (ecologically friendly), new energy systems, new environmental respectful behavior, etc. In other words, a substantial part of innovation in the tourism area could be generated around natural parks. Fourth, the economic system of ecological parks like tiger parks is a perfect one. One of the difficulties for any tourism attraction is that it starts to really create jobs locally once tourists stay more than one day or a few hours. Ideally a tourist should stay for several nights since most of the jobs are created around the night activities, not around the tourism spot itself. Night activities include hotel, catering and entertainment, sometimes gambling, etc. All these activities generate supporting activities from construction to hospitality support, etc. The rooms in Las Vegas are famously cheap exactly for that reason: by staying for several days, the tourists spend a lot on entertainment. In the case of tiger parks, it could be entertainment, handicraft, other wild life activities, even natural park museums, etc. All globally famous entertainment parks have grown thanks to the addition of attractions, leading the consumers to stay for more than one night. Another difficulty faced by tourism attractions is the need to attract different categories of tourists, from the low cost budget traveler to the middle class family with kids, to the spa and resort lovers. The advantage of tiger reserves is that the tiger, as a concept, attracts all categories of tourists and can therefore generate all kind of tourism infrastructures and support around the reserve. Why the tiger is a proxy for tourism infrastructures? This approach of tiger reserves as a generator of tourism jobs is just a trigger proposed to officials and investors to think differently about the natural reserves and about the ways to catch the pent tourism demand currently built by the middle class. Tigers are highly symbolic and a powerful attractor but rain forests, marine reserves, protected national parks can be seen as possible candidates for the same approach. As a consultant, I have been working extensively on regional dynamics, on tourism attraction and on jobs creation and I was always amazed both by the power tourism has for creating jobs and by the ignorance of the tourism ecosystem by senior executives at corporations or by senior officials in governments. The reason for this ignorance is probably that tourism is one of the most complex industries to understand and to manage within an industrial policy. It does not exist in as pure a form as automotive or steel or chemicals or even banking, etc. Tourism is a complex value chain around a service ecosystem where there can be growth only if all the elements of the chain are working properly together. This value chain comprises regulations (e.g. for tourism visa and park fees, construction, ecological parks but also for airport taxes, even for things like energy or telecom availability), transportation and infrastructures (e.g. from trains, airports, rental cars, to travel agencies to hotels to museums, parks management but also to guest houses), labor markets (the hospitality sector requires different forms of education inputs and labor contracts than most other industries, further more it involves a lot of grey, informal, labor market, hard to trace statistically but important economically), ancillary industries (e.g. handicraft, books, park guides, conference organization and “business tourism”). The economic interest of the tourism industry is in the completion of this value chain and how it takes advantage of the last link (the tiger reserve in our case). Nearly no statistical tool today can trace the value of the whole tourism value chain even if a special effort to the statistical dimension is provided by the United Nations. Furthermore, many of the elements of this tourism interdependent ecosystem depend on different administrations that are not really used to work or to cooperate together. The tiger reserve example used here shows however that there is one way to work around these coordination difficulties: working around specific projects one at a time and trying to mobilize the energies around them. Comments are welcome either directly to the author or on this blog. Tigers are endangered; tourism can save it.